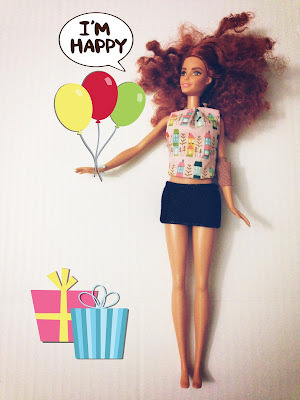 elli & nels *in stitches*: Happy Birthday Barbie! I'll be honest. 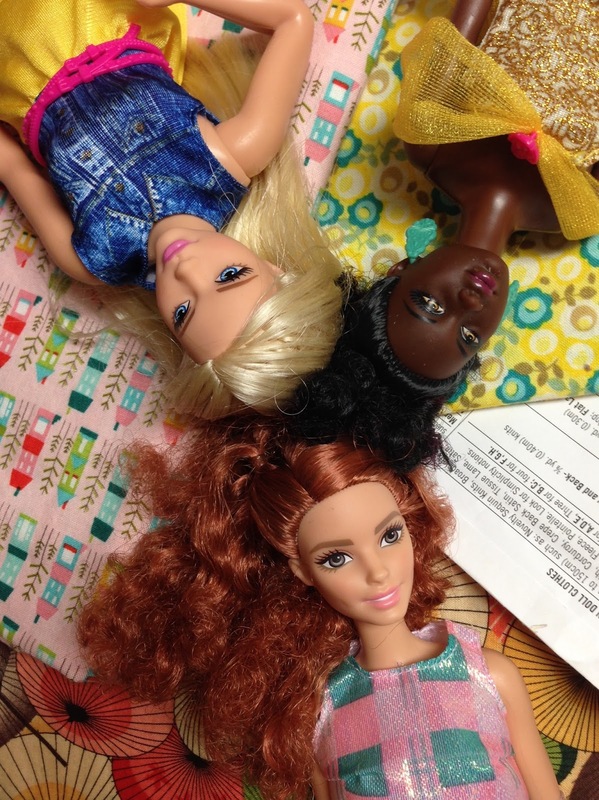 Until a couple of years ago, I'd never sewed for Barbie. I didn't start sewing as a child, and when my sister and I played Barbies we just used the outfits they came with. Sewing didn't become a real interest until after I was married! 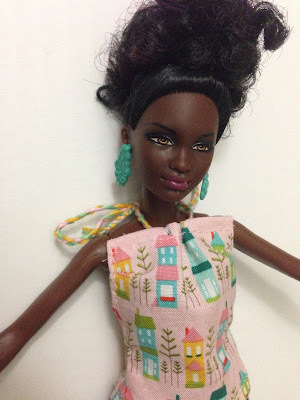 Then I sewed one Barbie dress (a pattern test, actually). 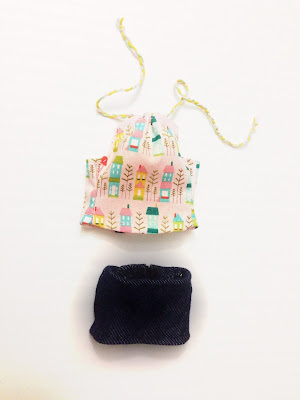 It was a lot of fun - I love sewing small things, but my girls were just too young to play with dolls much, and I was having too much dressing them to worry about their dolls. But lately my almost-4-year-old has been really getting into Barbie. After Christmas clearance at Walmart got us several new ones, and we found a Barbie house on a garage sale site. She's really getting interested in her own clothes, and I figure the next step is an interest in Barbie's clothes, too! 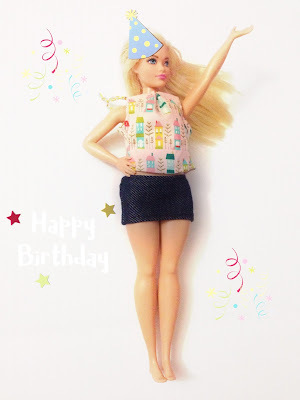 I tried to think of a "theme" to go on this post for Barbie's birthday, and when I looked over Sam's collection, I realized that she has at least one in each of the new "size ranges" - petite, tall, curvy. Interestingly enough I couldn't find any of her "standard" dolls. The dolls have different heights and - well - widths, but their torsos are roughly the same length. (The "tall" Barbie has a slight difference there from the "petite" one, but most of the height difference is in their legs.) That made me start thinking of things they could share, despite being different sizes, and I got inspired thinking about The Sisterhood of the Traveling Pants. Although in that story it's a magical pair of jeans that fit each size girl perfectly, I knew for Barbie I'd need something simpler. 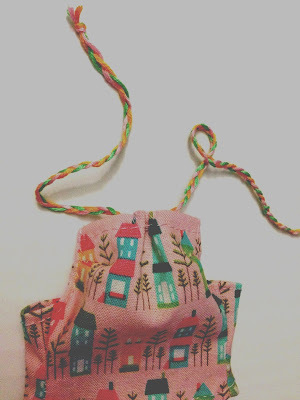 I went back to basics, hand stitching (hey, I'd never done it!) a halter top and mini skirt! I used Simplicity 4702 B and C for the base, changing up little things to make it easier to fit my vision of a "sisterhood" outfit. 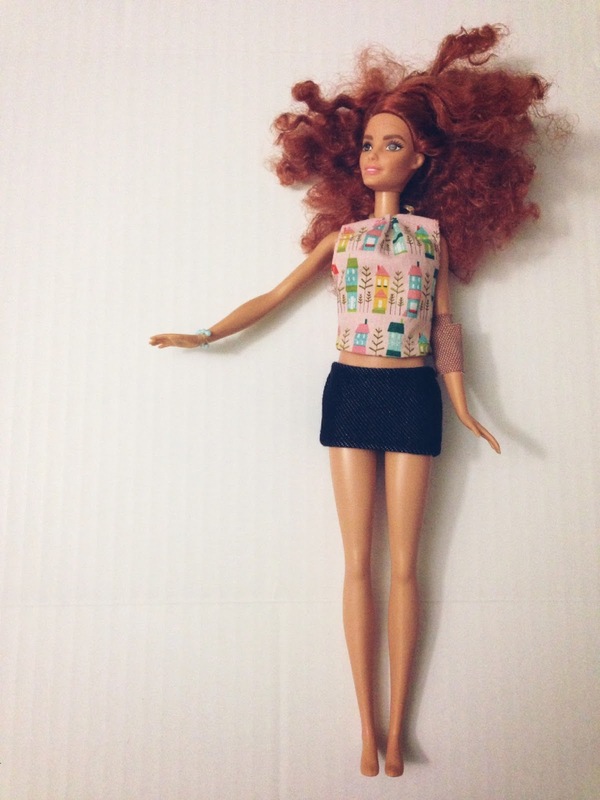 The skirt has shaping in the hips, which was awesome for Curvy Barbie! (My daughters have named them, but I can't remember what they are.) It seemed to just fit Petite Barbie perfectly, though it was a bit longer on her than on the other two, and though rather short on Tall Barbie it still looked awesome! I used a scrap of jegging fabric from Walmart - it's perfect. as it happens, halter tops are easier to fit if you're willing to tie the neck strap yourself. I braided strands of embroidery floss for mine, and tied it in a bow on each doll. The top corners of the top on Petite make me think of Priyanka Chopra's Oscars dress, albeit with more coverage! Haha! I added small darts to the top to be more accommodating for Curvy, but out of the three I think Tall wore it best! A Riley Blake quilting cotton served as the fabric for the top. Each Barbie has a "model" shot and a goofy "birthday queen" one. There was no real reason for the hand stitching, other than I've seen so many people talk about getting their start hand sewing Barbie clothes - I'm having that experience, just 15-20 years later! Let's be clear, I have far better results and more fun with a sewing machine - but this really made me appreciate all of you who learned to sew by hand, and I won't rule out hand sewing Barbie's clothes again! There's something sweet about it, a nostalgia that I feel even though I don't share it. So did it work? Well - I will say that knit fabrics have a better shot of being "Traveling Pants" worthy. Of course we know that "one size fits all" clothing rarely does just that! Definitely something I want to experiment more with. Happy Birthday, Barbie! You're a style icon, and you have your own sisterhood that lives on in the girls and women who love you! Want to see more? 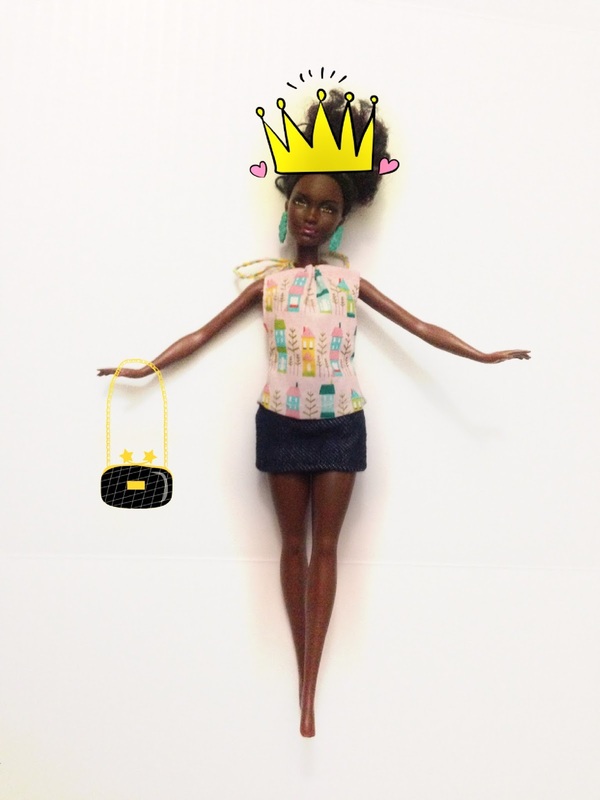 Check out these ladies and their love of Barbie and her friends! That outfit is so cute and I loved seeing how it worked for all the shapes. All these Barbies are giving me Barbie envy.